Hank Adaniya, Hank's Haute Dogs, shared his expertise with Kauai Community College students as a part of Hawaii Culinary Education Foundation programming. He interested students with his background in fine dining as renowned owner of Trio Restaurant, Chicago. Hank moved to Hawaii and created a unique vision to elevate the hot dog to haute cuisine in the Islands. His creativity flourished with lobster dogs, alligator dogs and other culinary innovations. The students learned from his marketing expertise and flavor profile exploration. Students taste tested Kosher, Kobe, natural casing and skinless hot dogs. They sampled a variety of innovative toppings including poi BBQ, Curry Ketchup, and Hoisen-Ginger Mustard. The ultimate tasting was enjoying foie gras haute dogs and shaking fries seasoned to taste with furikake, togarashi, herbs, and cheeses. 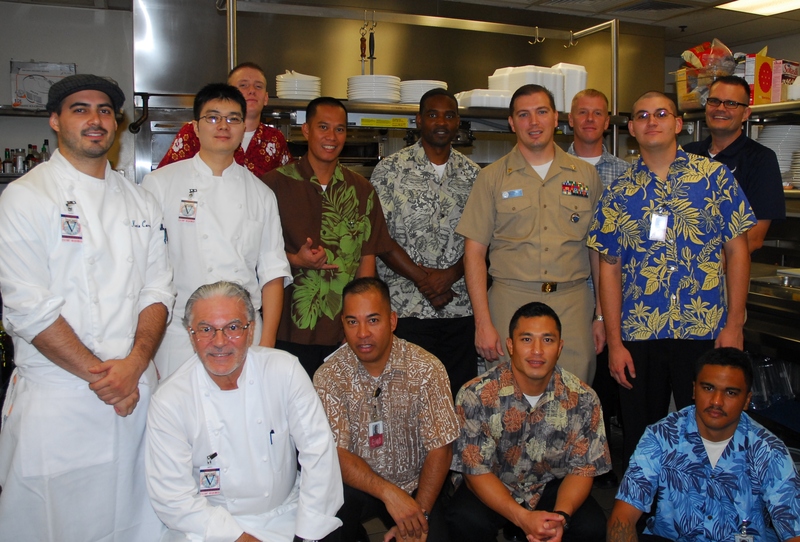 Chef Mavro taught a Hawaii Culinary Education Foundation Master Class at United States Pacific Command. The class covered the fundamentals of Sauces and Stocks focusing on classic technique and modern applications. Chef Mavro shared secrets to perfecting consomme, buerre blanc, Sauce Bordelaise, Buerre Rouge, White Wine Creamy Sauce, Tomato Sauce and Essence of Pinot Noir. Chef Mavro is a James Beard award-winner, one of the founding members of Hawaii Regional Cuisine, and is listed as one of the top eleven French Chefs working in America. Here is what military members said: "Chef made magic from scratch." // "The training was great." // "He made things healthier without cream and butter. The taste was still amazing."